Cruising in Southwest Florida is fun, but not without its’ surprises. We had ordered “Chamber of Commerce” weather and received about 50% of our request. 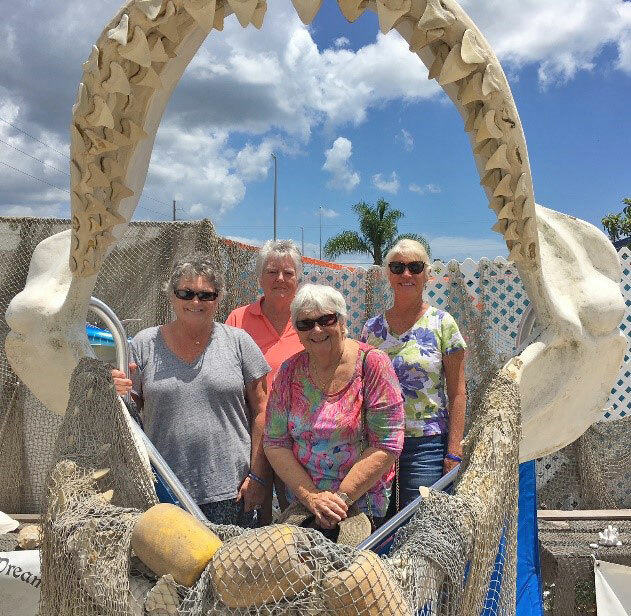 Under soggy skies, eight boaters from the Cape Coral Cruise Club ventured up the Gulf Intracoastal Waterway for our May cruise to Aquamarine Palm Harbor. Mike & Brenda Stewart, Len & Reta Grassini and cruise leaders Jon & Elise Lynch arrived by land yacht. Boaters included Lee & Brenda Jetton, Joe & Kelli Miller, Pete & Donna Oiderma, and, last but not least, Tal & Kathie Leonard. This may be one of the very few times that a CCCC cruise was led by landlubbers. By noon on Tuesday all the boaters had arrived and were enjoying the gorgeous pool and spa, that is, until the heavens opened up. Not to be deterred, a quick move to the pavilion and a riotous game of 99 erupted and the snacking began…It was tough! All our digits were needed and utilized to calculate the equation for evading the dreaded 99! While the boaters enjoyed the pool, marina, and cards, the non-boaters explored the glories of Grove City, Florida where we had reservations in a first-class “no-tell” motel. But there is a silver lining as rooms at this small place had full sized refrigerators, oven/range, and microwave which came in very handy. 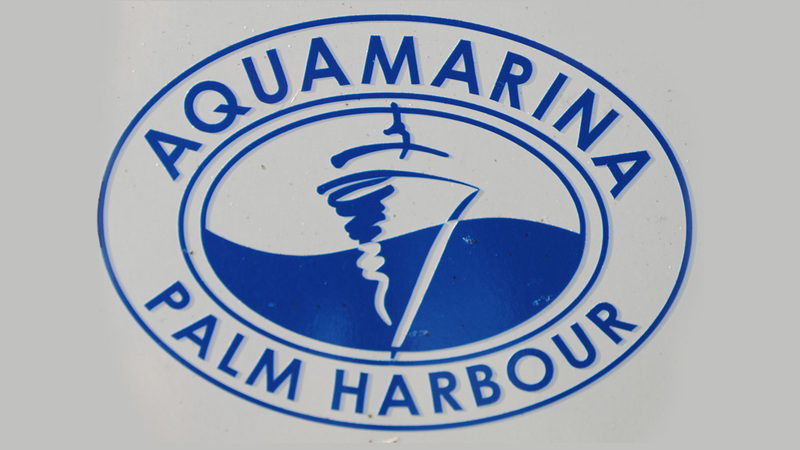 By 4:30 everyone gathered for happy hour around the Aquamarine Palm Harbour pool and dug into a fabulous array of heavy hors d’oeuvres. The evening turned clear and the sunset was stunning. On Wednesday, after a breakfast of French toast casserole with blueberries, Canadian bacon, fruit salad and pastries, all the boaters were challenged to a Selfie Scavenger Hunt. Given a list of 14 different “selfie” options, the group went to work immediately! Many very creative and innovative selfies were taken and shared with the group. Pete and Donna were the big WINNERS and of course won a fabulous prize! Our group began a whole hearted effort to enjoy the few hours of sunshine we had. And a few of us indulged in a little retail therapy at a nearby souvenir shop. Luckily the best stuff was in the parking lot and we managed to leave without the “Jaws” because if didn’t fit in the truck. Mike Stewart served as grill master for the hamburger cookout and did a superb job as usual! Thursday morning dawned bright and beautiful. A small breakfast was served, accented by Mimosas and Bloody Marys from Lee Jetton and Pete Oiderma. The only way to start the day! Thursday afternoon a caravan of three cars ventured inland to Catania’s Winery in Englewood. Pati & John Queen even drove up just for the winery! 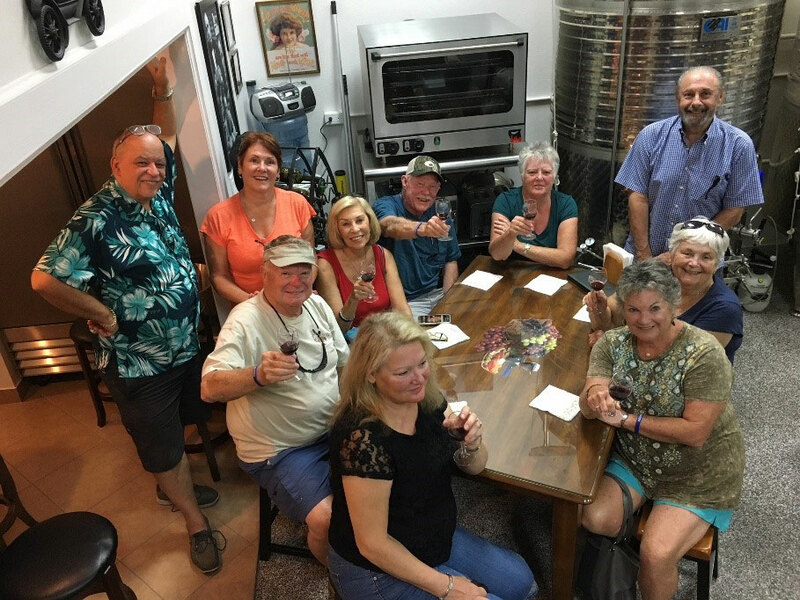 Poised in an unremarkable industrial strip, the winery’s owner John Catania, native of Sicily, regaled us with wine tasting tips, and suggestions on when to send the wine back at a restaurant, while we sampled an assortment of delicious red and white wines. He was quite a character and many of us left with souvenir bottles of Catania’s great tasting wine. Unfortunately we waited a little too long to leave Englewood and were soon overwhelmed by a soaking rain storm. The ride back to Palm Harbour was exciting indeed! We enjoyed the culinary expertise of Johnny Leverock’s Restaurant for dinner Thursday evening. Their entree selections were outstanding and no one wanted dessert. That is until later when the peach cobbler appeared. What a perfect ending to our cruise to Palm Harbor.